How can the numbers move so sharply in just 24 hours? I have tweaked the model slightly at a couple of points recently in order to make it more sensitive to new information. But these adjustments are very minor, and their effects are fairly trivial. The principal reasons these numbers have become more volatile are twofold. Firstly, we're finally getting into crunch time. The closer we get to the election, the smaller the true margins of error in the polls, so relatively small advantages can become more meaningful. But secondly, we have a lot more data to look at. If Barack Obama looks like he's moved up a point or two between two or three polls, that may not be particularly meaningful, and our model will tend to treat it as noise. If, on the other hand, Obama appears to have gained a point or two between 20 or 30 polls, which is what we're getting on a daily basis nowadays, we can say with more certainty that a real shift in the electorate has occurred. Which of these numbers will McCain partisans like? The +3 from ARG in New Hampshire. The +7 in Virginia from National Journal. The virtual ties in Wisconsin, Pennsylvania and Iowa in the Big Ten poll. The +6 in Florida from SuvreyUSA. And which will Obama partisans like? The +10 in Colorado from InsiderAdvantage (very probably an outlier, but outliers are OK when we're able to average them in with other polls). The +3 in Indiana from Ann Selzer (although remember that Selzer polls have had a rather strong Democratic lean so far this cycle). Two polls showing Ohio drawing to a tie, and the same in Florida. The Michigan number from the Big Ten survey. The Oregon number from the Portland Tribune. Both of the New Mexico numbers. Maybe the Rasmussen number in New Jersey. 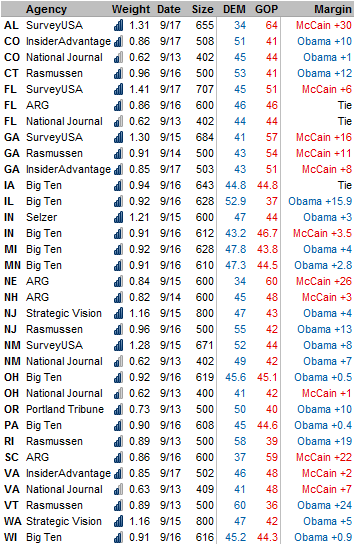 That is, by my count, 10 or 11 or "good" state polls for Obama and 5 or 6 for McCain. The job of our model is to see the signal through the noise. There is quite a bit of noise, with so many pollsters in the field in so many different states, and so many different factors affecting voter preferences. Eerything from national news events to advertising blasts in individual states will impact these numbers -- a really heavy ad buy in a particular state can sometimes move the numbers there by a couple of points, often only for no more than 24 hours. But there is also some signal, and today it points toward Obama gaining a tangible amount of ground. A lot of people have asked me to comment on the series of new polling put out by a consortium of Big Ten professors, and by the National Journal, respectively. Neither of these polls have any track record, and so there is no completely objective way to evaluate them; our model assigns any "unknown" pollsters a slightly-below-average rating. Neither has a statistically significant Democratic or Republican lean, from what we can tell so far. I like the level of disclosure provided by the Big Ten polls, which have a complete set of cross-tabular results available. If you want to gain stature as a "new" polling outlet, that is the way to do it. The National Journal polls also provide a fair amount of supporting detail, although it is a bit more cumbersome to navigate through. Nobody takes politics more seriously than the boys at the National Journal, so you can assume that there was a lot of thought given to their methodology. I do wish, however, that they had elected to go with sample sizes larger than 400 persons, which will produce erratic results even if you're doing everything else right.